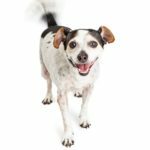 The information you need to keep your dog happy, healthy, playful and loyal. Your pup is your best friend. He adores you. Your dog wakes you up in the morning. He becomes sad when you leave him for work. He can’t wait for you to return home from work. He loves watching T.V with you. You love him too. His health is your priority. You feed him properly every day. You want to groom him yourself. Maybe you’ve heard stories about groomers who abused dogs. Or you want to save some money. 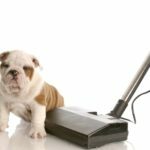 But you need to know that grooming your puppy can be difficult, messy and occasionally frustrating. Your dog may refuse to follow your commands. Or, what’s worse, you might be making grooming mistakes. Grooming is a skill. And like other skills, you can master it with practice and persistence. How you groom your dog affects his behavior and overall health. Therefore, it is of utmost importance that you learn how to groom your dog. 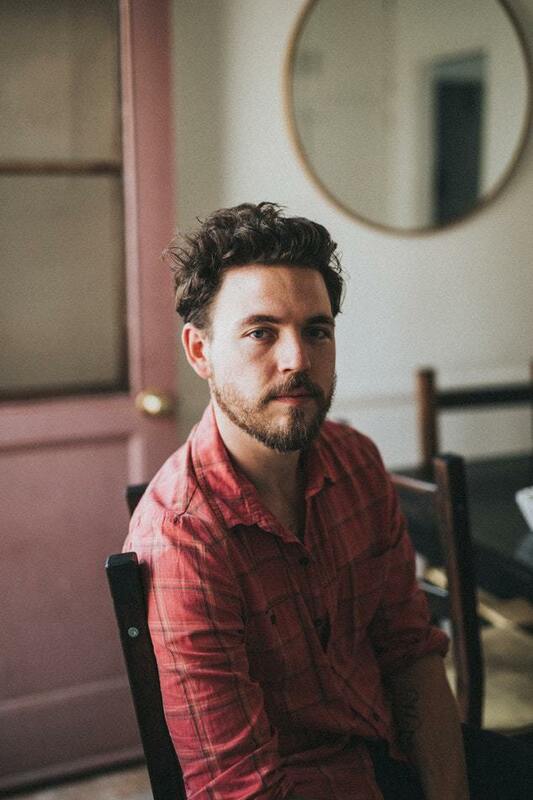 Even if you realize you’re guilty of previously committing grooming mistakes, don’t give up. Learn how to avoid them, and you’ll have a healthy, clean dog who doesn’t mind getting a bath or having his nails trimmed. If you want the grooming process to be stress-free, you must prepare your puppy to be groomed. Everything will be easier if you start training him as early as possible. Make sure your puppy is comfortable with being touched everywhere. One way to do this is to touch him everywhere every day. Touch him when playing and make it fun. Soon, he will start associating your touch with love. Once he is comfortable with you touching him anywhere, have family and friends touch him. 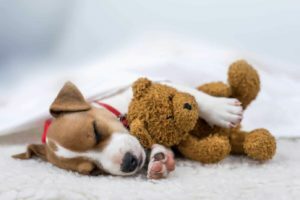 You want him to be accustomed to other people touching him because you’ll need to take him to the vet regularly and you might need a groomer’s help someday. Touching your dog not only is soothing; it also can help you detect lumps and other minor injuries that might need medical attention. To make grooming comfortable, praise and reward your dog while bathing or brushing his fur. Give him treats when grooming him. Soon, he will understand grooming is fun. Remember, patience is the key to success. Do not rush him. He naturally will get used to grooming as you do it properly and regularly. Just because your dog is clean or his scheduled grooming session is next week, that doesn’t mean you can ignore grooming. Some dog owners make the grooming mistake of going months or even a year without bathing or brushing their dogs. If you do not groom your dog regularly, he will be more likely to fight the experience. That will make grooming stressful and frustrating for both of you. Build regular grooming sessions into your dog’s routine. 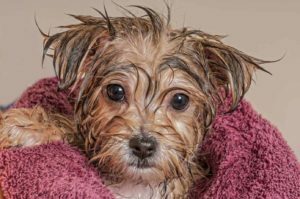 By cutting his nails or brushing his hair regularly, you’ll reduce your dog’s stress about taking a bath. If your dog is just a little dirty, you can also delay giving him a full bath by using grooming wipes. Some dog owners hate grooming their dogs. They want to get the work done and move on to other activities. While you may think you are saving time, moving too fast comes at a cost. 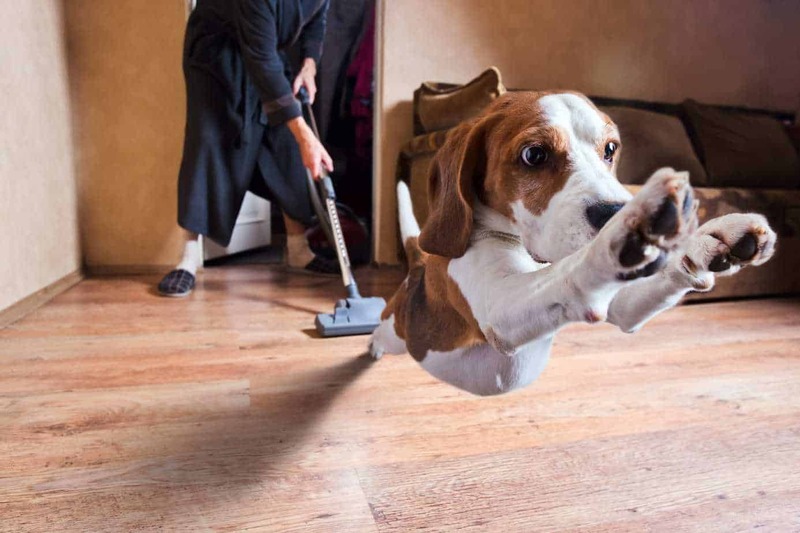 You fail to clean your dog correctly. Worse, you could injure him. 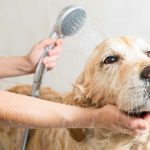 When you rush, you increase the risk of getting shampoo in his eyes, which will irritate them and make your dog even less willing to take a bath. You also may fail to properly rinse off the shampoo, which can cause your dog’s skin to get dry and itchy. The best thing is you can do for yourself, and your dog is to slow down an take your time. Wash him slowly and efficiently. Rinse him thoroughly to remove all shampoo. Brushing before bathing is especially important if your dog has long hair. Not only does brushing remove dirt and loose hair, failing to do so makes it more likely the hair will tangle when it gets wet. Wet, tangled hair can be nearly impossible brush without causing pain and discomfort for the dog. You also need to brush again after the bath. Brushing helps remove any additional loose hair and will help keep your dog’s coat shiny and healthy. Always be sure to use a soft brush that doesn’t pull the hair. Avoid rough or rigid brushes. If you have a dog with a lot of hair, consider investing in a de-shedding tool like a Furminator. Most dog owners and their dogs hate nail-trimming time. Owners worry they’ll mistakenly cut the nails too short and cause the quick to bleed. The quick looks like a pink or black circle depending on the color of your dog’s paws. Dogs sense their owners’ nerves, and that makes them unwilling to submit to the process. Owners who are willing to cut their dogs nails need to invest in good clippers and learn the proper way to cut nails. They also need to keep their clippers sharp. Dull clippers will crush nails instead of trimming them. Another option: Pay a vet tech or groomer to trim your dog’s nails. Shaving too close to your dog’s skin with dull clippers can cause razor burn. If left untreated, razor burn can pose a severe risk to the health of your dog. When shaving, always use sharp blades since they do not catch and skip. Sharp blades will protect your dog’s skin and make his coat spread evenly. 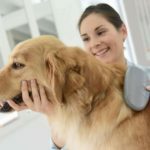 Grooming your dog is essential for his health and overall well-being. 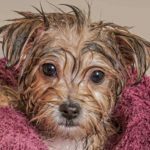 It is crucial to avoid grooming mistakes, so you properly clean your dog without hurting him or wasting your time or money. Still worried you don’t have the skills you need? Consult your vet or a grooming professional for more tips. 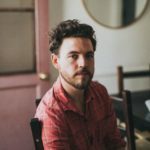 Scott Mathews is a professional content and SEO writer for nerdy writers and my essay services. He regularly contributes his views and opinions on EssayMama and Australian Writings. During his free time, you’ll find him playing with his two lovely dogs or assisting college students on Bestessaytips. 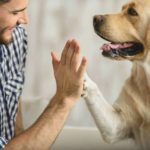 *DogsBestLife.com is a participant in the Chewy Associates Program, an affiliate advertising program designed to let our site earn fees by linking to Chewy.com. Can you decipher dog tail messages? © 2019 by Dog's Best Life online magazine.